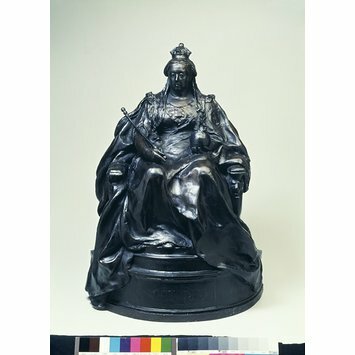 This bronze of the seated Queen Victoria is cast from a model for the Victoria Memorial, made by Thomas Brock in the early 20th century. This bronze, together with the bronze cast of Truth (V&A no. A.9-1977) were probably taken from Brock's second more elaborate model produced at a scale of 1/10 full size which the sculptor stated were copleted and approved by the King in June 1902. Two further models for the Victoria memorial outside Buckingham Palace are also in the Museum's collections (inv. nos. A.7 and 9-1977). These three bronzes were given to the Museum by Mr and Mrs Roland Morris in 1977. Mr Roland Morris's father was William Thomas Morris (1874-1944), Chairman and Managing Director of the Morris Singer Company who cast the works. 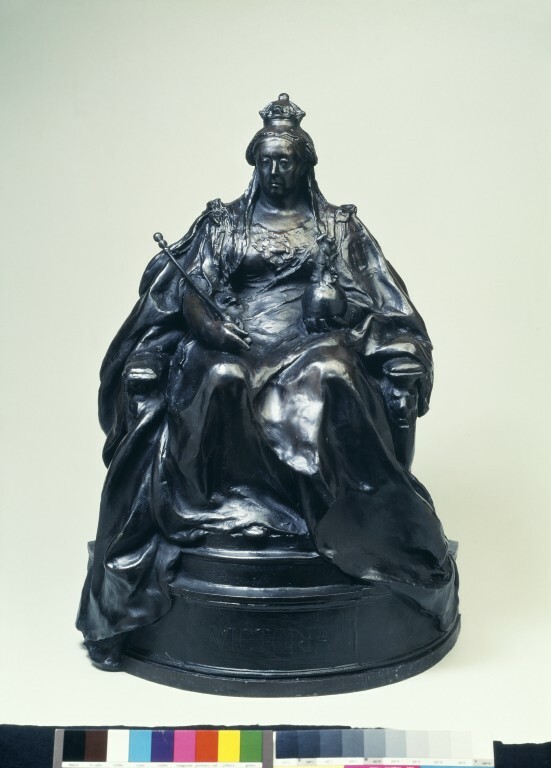 Bronze model of Queen Victoria. Seated statue of Queen Victoria, in her right hand a sceptre in her left the Orb on which is a group of Saint . George and the Dragon. Inscription. Given by Mr & Mrs Roland Morris. It is cast by John Webb Singer & Co of Frome Somerset. Mr Roland Morris's father was William Thomas Morris (1874-1944), Chairman and Managing Director of the Morris Singer Company. This bronze, together with the bronze cast of Truth (V&A no. A.9-1977) were probably taken from Brock's second more elaborate model produced at a scale of 1/10 full size which the sculptor stated were copleted and approved by the King in June 1902.